Oscar Best Dressed 2017- Make Celebrity Style Work In Your Wardrobe! Last night’s Oscar Best Dressed stunners certainly played by the K.I.S.S. (keep it simple stunning) principle of memorable celebrity style. Sure there were plenty of heavily embellished gowns, beading, draping and opponent fabrications, I’d bet that each of the more ornate gowns were a testament to incredible craftsmanship. But what happens when the dress is fussy, the hair is fussy, makeup is heavy, the wearer gets lost in all the extras and becomes forgettable, particularly on TV where the more graphic the appearance, the better it stands out. 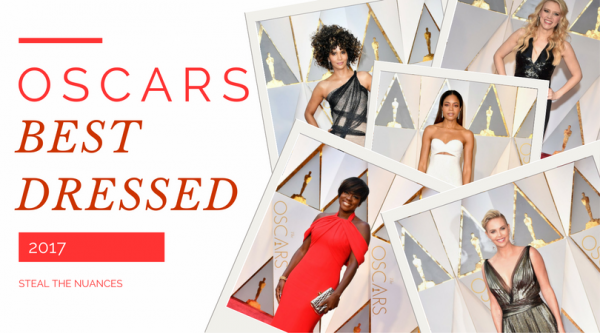 Then you have the visual stunners that you can’t forget the next morning- Viola Davis in striking red, Halle Berry and that hair, Charlize Theron in a golden goddess gown, Kate McKinnon in architectural black. All these looks could easily translate into not only your special occasion wardrobe but takeaways to consider the next time have a speaking gig, media interview or even Facebook video. Top 5 Best Dressed Celebrity style that you can work on you own. Viola Davis in Armani Privé. 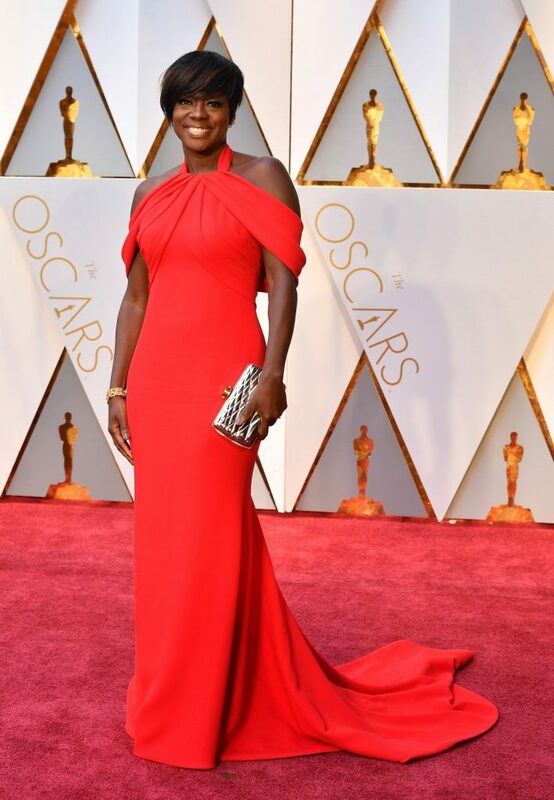 Oscar Best Dressed Look #1: Absolutely my favorite look of the evening! The dress was so exact, not a superfluous detail, only expert draping to spotlight her face and figure. The clear red color is the pop of color that will look chic for years to come. Her short hair was styled to compliment the clean graphic lines of her dressed. Just perfection on every level. Oscar Best Dressed Look #2: Blondes wearing gold can get tricky. If there isn’t any shade differential between the dress and their hair what could be elegant and striking ends up washing them out. Not in this case. The darker burnished gold is both elegant and flattering to her coloring. The goddess styling is a modern take on old Hollywood glamour. I do think a slightly less drapey bodice would be more flattering on film and in photos. Kate McKinnon in custom Narciso Rodriguez. Oscar Best Dressed Look #3: Clean and graphic lines always make a black dress look modern; especially the cut out sides on this one. The simplicity of this look is what makes it a standout. Long goddess waves are an unexpected accent to the otherwise clean look. Naomi Harris in Calvin Klein by Raf Simmons. Oscar Best Dressed Look #4: Granted, there could be an argument about wearing a short dress on the Oscar red carpet. But style is about being confident in your look and owning it, truly the case here. Truth be told, I’m a huge fan of Raf Simmons and always feel right when I wear his timeless, non fussy designs. The sleek hair is flattering to her face and follows the pristine line of the dress. Beautiful. Oscar Best Dressed Look #5: Wow, that killer go big or go home hair! Those curls!!! When you have gorgeous attention-getting hair the rest of your look needs to take a back seat to let your hair make the style statement. Everything works up until the beaded fringe of the dress. Adding another obvious element breaks the fluid line of the total look. I’m in love with this look right up to a midi length, then it gets too much. Do you need a simple + elegant path to elevate your style? I created The Style Incubator just for you. My new game-changing program will help you soar your style from the ground up! Join me, here. Quick Tip Video: What’s your superpower?